For many years we have been supplying and using Sony LTO tapes, this page focuses on LTO tape technology and how they are made. They are not the most expensive or cheapest, but what you do get is first class support and service when using Sony LTO tape media. Their attention to detail and quality processes are world class. An LTO tape needs to be robust as it contains critical company data that needs to be protected. Throughout it's life a tape will be loaded, un-loaded, dropped and it may also be subject to various temperature changes. In an emergency you need to ensure the data you backed up is intact. As mentioned our preferred choice is Sony. The cartridges were dropped at different orientations to confirm that these cartridges offer tough protection. Sony also conducts various tests simulating transportation and storage conditions at the stage of material selection and cartridge design so that the cartridges have sufficient strength against the temperature variation. 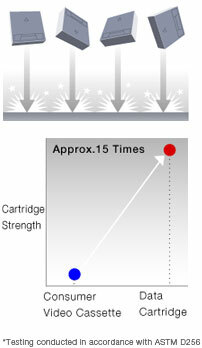 The polycarbonate used for the cartridge shells offers 15 times more impact resistance than the polystyrene commonly used for consumer video cassettes. Both screws and ultrasonic welding are used in the assembly of the cartridge to enhance its rigidity. This guards the cartridge from damage from drop impact, protecting the valuable data inside. Sony’s unique metal leader pin at the end of the magnetic tape resists abrasion even when exposed to the repeated loading and unloading found in library systems. This metal leader pin enables stable operation for more than 20,000 repeated cycles in the tape drive. The coating on an LTO tape has to have very stable physical properties in order to perform and hold data for up to 30 years. The media cannot degrade or warp otherwise the vital data will be lost. The coating must be applied evenly over the entire width and surface of the tape to ensure optimum digital recording of your data. The storage capacity of magnetic tape has increased dramatically in recent years. 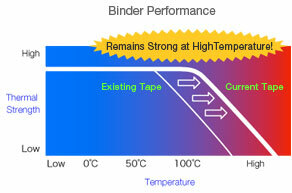 This means that tape must be designed to have high recording density in order to save more data in less space. To realize this, it is essential to coat the tape surface with a thin magnetic particle layer. Today, this magnetic tape layer has become thinner than 200 nanometres (one nanometre is one-millionth of a millimetre). Aiming for even greater storage density, Sony has pursued technological development to create an even thinner layer of magnetic particles. Our advanced thin-layer coating technology is now capable of uniformly applying magnetic particles as thin as some tens of nanometers over the entire tape surface. For the paint to have the required thickness, you might need to apply one litre of paint per car. Now, imagine how much paint is needed to coat the entire car surface if Sony’s thin-layer coating technology is applied. The answer is: an amount less than one teaspoon. Sony’s thin-layer coating technology would allow this small quantity of paint to cover the entire car surface very thin and uniform. With magnetic particles as small as tens of nanometres, Sony’s thin-layer coating technology allows a few particles lying on top of each other (3-layer) to cover the entire tape surface without gaps, enabling the storage of large amounts of data. The layers of material that make-up an LTO tape need a special coating to keep everything in place. Sony is proud of its technology that enables each of these nanometer size magnetic particles to be evenly encapsulated by the binder. This technology enhances the characteristics of the data storage tape containing your precious data, providing precise and stable writing and reading of data as well as enabling these characteristics to be maintained for many years. The use of multiple layers provides the protection that dramatically enhances the ability of the magnetic particles to resist rust (oxidation which decreases the performance of the tape). The use of a binder with a high level of thermal stability not only disperses nano-scale magnetic particles individually, but also allows the magnetic layer to have more stability against temperature variation. This realizes stable recording characteristics regardless of high tape temperatures caused by the rubbing of tape inside the tape drive. It also ensures archival stability of the tape.